Every Android user has seen this warning message for sure “Raise volume above safe level? 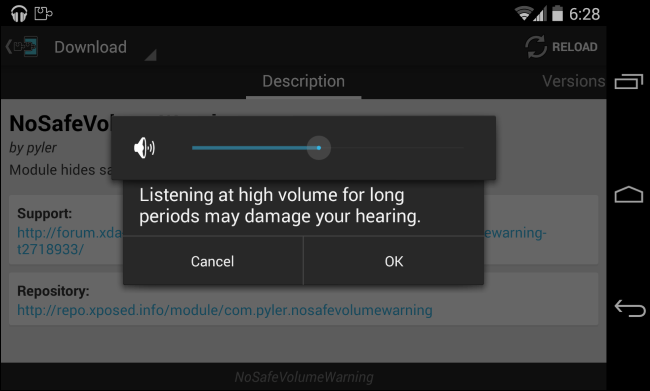 Listening at high volume for long periods may damage your hearing.” In other words, you can say that this is an Android Disable Volume Warning message or error. Now not all the smartphones users want to listen to the music on a level which is assigned to the device by itself. I personally don’t give a popcorn to this, but some users find it irritating, so for all those, I have made a post that will help you fix Android Disable Volume Warning. Open default Music Player app, tap the “Menu” button. Check the “Smart Volume” option, Turn it on if it’s Turned off. A dialog will appear telling you that “Smart volume is enabled“. Tap “OK“. This method is a bit convoluted and you have to very conservative while trying this on your Android device. Launch Tasker on your Android device. Tap on the + icon. Ta on New Event, go to Tasker –> Monitor Start. Create a new Task and name it whatever you want. Tap on + to create a new action. To set action settings -> Task –> Wait set it to wait for 30 seconds. Now create a new action and then go to Plugin-> AutoTools->Secure Settings. You have to press the pencil to open configuration settings. Select custom Settings and Enter Global for the Setting type. Set Input type int and set value = 2. This will be all, now if you don’t want to go through with this convoluted method you can download the Tasker file and import it.